How many of you can relate to this? Going to get a Christmas tree or take family pictures or go to a one of the fun family events going on this time of year and you picture laughter and fun and holding hands…. and then. REALITY. You’re all arguing, kids are fighting and you’re absolutely exasperated and worn out. And THAT is BEFORE even getting out of the driveway!!!! That’s exactly what happened to us when we went to go get our Christmas tree this year. And I know you can relate, so I just had to share this hilarious, maddening, chaotic, merriment and the chorus of, “WE WILL have FUN and MAKE this a FUN, FOND, FAMILY MEMORY!!! !” You think it’s going to be The Hallmark Channel – instead it’s more like This Is Us and The Griswold’s. 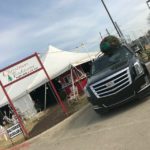 This is our REAL life escapade as we went to find the best real Christmas Tree. So when our kids are asked, “What’s your fondest memory from childhood?” Certainly this is it! I had it ALL PERFECTLY PLANNED OUT! Let me set the scene: The house is filled with sounds of magical Christmas Carols filling us with delight, we are all laughing together, the snow gently glides to the ground bringing glimmering wisps of wonder, the children were nestled all snug in their beds, holiday baking still wafting in the air – and upon the children’s gleeful wake from slumber, their moods are filled with pure happiness, hugs for each other, smiles – all getting along, not a cross word…blissful merriment abounds. It’s all joy, smiles, everyone is laughing, ready to make this perfect lifelong holiday and tradition. And welcome to it. It’s real. It’s messy. It’s frustrating. This is just the “let’s keep it real’ of reality. And yet it’s our every days and our moments of time ticking by and it’s our opportunity to TAKE ON all the stress or FOCUS ON ALL THE REST. Check this out and listen in as we tuned in as The Hallmark Channel and landed somewhere in between This Is Us and The Griswold’s…. You’re also empowering yourself – because it’s done! is one ornament 2 millimeters off where you want it? WHO CARES? They don’t. They care that they helped, they feel important, they look to you for approval and, “WOW! Look at all the work you did! You did FANTASTIC! Thanks so much for helping! You’ve really made a big difference! Check our this hilarious escapade – and I love your comments and questions, please keep tuning in – as the podcast isn’t one EXTRA thing to do – it’s a quick click and offers YOU a realization that we are all in this together!